This fascinating journey takes us from the gleaming metropolis of Kuala Lumpur to the idyllic beaches of Langkawi. We discover colonial buildings in Malacca, visit orphaned Orang-utans at Bukit Merah and trek through one of the oldest rainforests in the world in Royal Belum. The trip then takes us to colourful Georgetown where we get the chance to sample some authentic Malay cuisine before ending on the tropical island of Langkawi. We join our trip in Malaysia's capital, Kuala Lumpur. East and West rub shoulders in this eclectic and energetic city. KL (as it is known locally) has a hugely varied population, comprising mainly of Malays, Sikhs, Chinese, Indians, Tamils (many in local dress), and the odd splash of saffron from a robed Buddhist monk, adding colour to the vibrant street scenes. After checking into our hotel, the rest of the day is free at leisure. This morning we embark on a walking tour to uncover some of the cultural diversity of this lively and modern city. The tour starts at the colourfully decorated Guan Yin Temple, an ornate Buddhist temple dedicated to Guan Yin, the Goddess of Compassion. We then venture into Chinatown and onto Petaling Street, a pedestrianised lane lined with traditional Chinese lanterns and where anything from sunglasses to Bonsai trees can be bought. We move next onto the Hindu temple of Sri Maha Mariamman, a towering temple that is South Indian in style, and is said to be the oldest Hindu temple in all of Malaysia. On our way out of Chinatown we stop via the Central Market before crossing the Gombak River and onto the city's birthplace. This area offers a stark contrast from Chinatown and is full of historic buildings such as the Cathedral of Saint Mary and the Tudor-styled Royal Selangor club, from Malaysia's colonial days. The rest of the day is free at leisure. If you would prefer to explore, you may wish to visit 'KLCC' , the area in which the magnificent Petronas Towers lie. For wonderful views of the Towers along with a choice of Asian-inspired cocktails, head for the 'Sky Bar', residing on the 33rd floor of the Traders Hotel, directly opposite the towers. This morning we head out of the city and on to the iconic Batu Caves. Some 272 steps lead up to the sacred Hindu temple that lies inside the cave, and wonderful views of the city and beyond can be had from the entrance. The temple is a shrine to a Hindu deity, Lord Murugah and the complex consists of three caves full of colourful Hindu murals and artwork. After some time spent exploring, and perhaps witnessing a puja if we are lucky (a Hindu ceremony of worship where often an offering to the gods or deity will be made), we will continue south and drive onto the colonial city of Malacca. This afternoon we will then visit Villa Sentosa, a traditional house offering an interesting insight into the daily lives of a typical middle-class Malaysian family at the turn of the 20th century. This house-come-museum has been kept almost entirely as it was 100 years ago, and is located within the sleepy settlement of Kampong Morten, a village community hidden within the confines of the city. This evening we include a river cruise, offering an interesting vantage point to watch the sun set over the colonial cityscape. Malacca is one of the oldest towns in Malaysia, and certainly the most cosmopolitan. In its time it has been ruled by the Portuguese, the Dutch, the British and the Japanese, finally becoming Malay in 1957. Old Malacca is a fascinating area to wander around by yourself, and we include a walking tour of some of the major sights such as the tomb of Hang Kasturi, one of Malacca's five great 15th century warriors, and Cheng Hoon Teng Temple the oldest Chinese temple in Malaysia. This morning has been left free for further exploration of the narrow winding streets of Old Malacca, a city best explored and experienced on foot. Later this afternoon we transfer by bus back to Kuala Lumpur, where the evening is at leisure. We later continue our journey north and cross into the Belum Rainforest. The Royal Belum State Park covers a large swatch of northern Malaysia and is believed to be one of the oldest rainforests in the world, dating back over 130 million years. Upon arrival in the park, we settle in to our rooms where the rest of evening is at leisure to enjoy our surroundings. After breakfast this morning we head out by boat onto the Temenggor Lake to visit the aboriginal villages of the Orang-Asli people. Translated from Malay to literally mean 'the original people', these tribes are indigenous to Peninsular Malaysia and live remotely in the forest regions of the north. We visit the Jahai and Temair tribe, where we learn about their ancient customs and traditions that have been passed down to them for generations. We will then continue our journey through one of the world's oldest forests on foot where, if we are lucky, we have a chance to encounter the incredible Rafflessia flower (seasonal), the world's largest flower. We plan to take up spot next to the beautiful Sungai Ruok Waterfall for our picnic lunch, before returning back to our rainforest retreat. This afternoon has been left free where we can either relax in our surroundings or take part in a number of optional activities organised with the resort's front desk. There is a variety of excursions on offer which include jungle walks, a river cruise, fishing, bamboo rafting and night walks. We leave the tropical rainforest behind today as we wind our way out of Royal Belum State Park and onto Butterworth. It is here we leave the road and the mainland behind as we board our ferry to cross over to Georgetown, Penang Island. Upon arrival, we will visit the charming temple of Khoo Kongsiwhere we can admire its intricate carvings, with its woodwork bearing all the hallmarks of master craftsmen from China. We then continue on foot to the 'Little India' of Penang, a melee of stalls selling colourful sarees, garments and bangles through to household items and crafts. We also have the chance to try some local delicacies such as 'Teh Tarik', a kind of cappuccino tea made with foam and milk! Often called the 'Pearl of the Orient' by the local people, Penang lies some 4km off the Malay mainland. Its deep-water harbour is ideal for trade and so the island has become a haven of commerce. This morning we take an excursion around the island by private bus; visiting the majestic Kek Lok Si Temple, located on top of a hill, giving us a good insight into local life as it takes us through rural villages. You can also ride on the funicular railway to the top of Penang Hill (optional) for far reaching views across the island. In the afternoon you are free to explore. The Botanical Gardens are beautiful and can be reached quite easily by local bus, and there are many other interesting mosques and Buddhist temples to see. Appreciators of art should search out the local batik work at the Penang Art Gallery. In the evening we will organise to eat at one of the many local food stalls that Penang is so famous for, whether Indian, Chinese or Malay, the choice is yours! We rise early this morning for our ferry to the idyllic island paradise of Langkawi, a journey of approximately three hours. Langkawi is an archipelago made up of 99 islands lying just off the west coast of the Malaysian Peninsular. Surrounded by turquoise waters, the interior of the main island is a mixture of jungle-clad hills and picturesque paddy fields. This lush interior is encapsulated by white-sand beaches lapped by the warm waters of the Andaman Sea; an ideal place to relax or explore for our last few days in Malaysia. We will be met on arrival on the island and transferred to our base for the next 3 nights, where the rest of the day has been left free at leisure. Today is a free day where you can choose to relax on the beautiful coconut palm-fringed beaches or perhaps snorkel amongst the tropical fish of the Andaman Sea. If you would prefer to remain more active, there are a number of optional excursions which can be arranged. Optional excursions include a cycling tour where you can explore some of the island's towns and villages on two wheels, an island-hopping cruise where you can discover some of the lesser-visited islands of the archipelago, or a visit to the Northern Mangroves taking in the unique geology, flora and fauna of this area. We have another free day to relax, unwind, or explore. The trip ends in Langkawi this morning after breakfast. Pack for hot conditions. Bear in mind that the region is tropical (humid) and that days can be very hot. Lightweight rainwear is advisable all year. Casual clothes are the most practical (something with long sleeves, and long trousers for evenings). Malaysia is a Muslim country so dress with respect, tight or brief shorts and clothes should be avoided by both men and women. Comfortable shoes and sandals. Lightweight walking shoes are recommended. One main piece of baggage and daysac. Remember you are expected to carry your own luggage so don't overload yourself. A small torch, some insect repellent and a water bottle for walks. Although entirely voluntary, tipping is a recognised part of life in this region of the world. Some local staff will look to members of the group for personal recognition of particular services provided. Accordingly you should allow £20. Malaysia: Visas are not required by UK, Australian, New Zealand, US and Canadian citizens. All passports must have at least 6 months validity after departure from Malaysia. Other nationalities should consult their local embassy or consular office. Malaysia is one of the least visited in the South East Asian region and this holiday is planned to showcase the diversity of the Malay Peninsula. 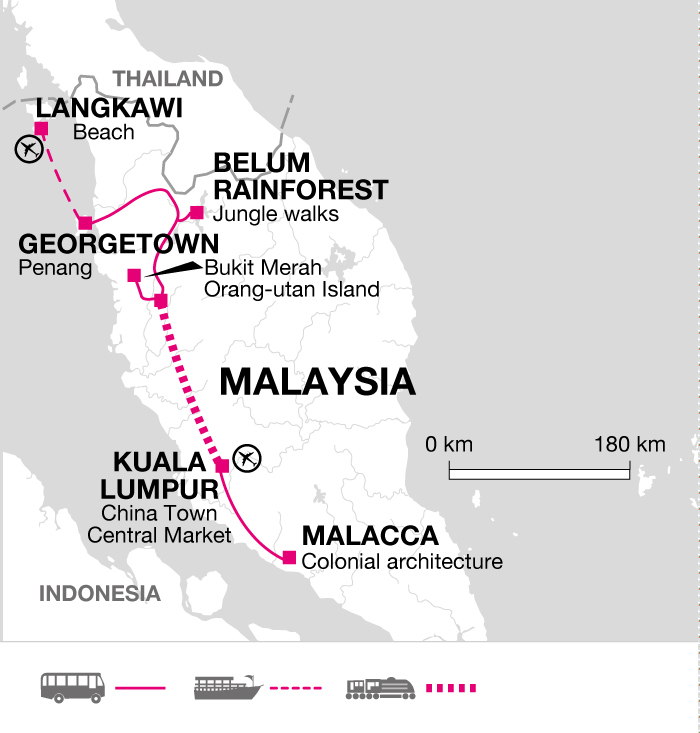 You will journey form north to south and really experience everything from an ancient Chinatown in Penang to the jungles of Royal Belum to the tropical beaches of Langkawi. Along the way you will find the people as diverse as the landscape and architecture - ethnic Malay, Thai, Indonesian, Indian and Chinese people truly make Malaysia the melting pot of Asian cultures.